Opera Software is usually pretty quick in releasing the final version of the Opera web browser once they have reached the release candidate stage. This time it took four release candidates before they shipped Opera 11.10 final. Downloads are already available on the main Opera homepage, and Opera 11 stable users should see update notifications soon. A check with the beta version of Opera 11.10 did not find the update yet, and it is not clear if beta users will see update notifications or if they need to install the Internet browser manually. Manual installation was a breeze. 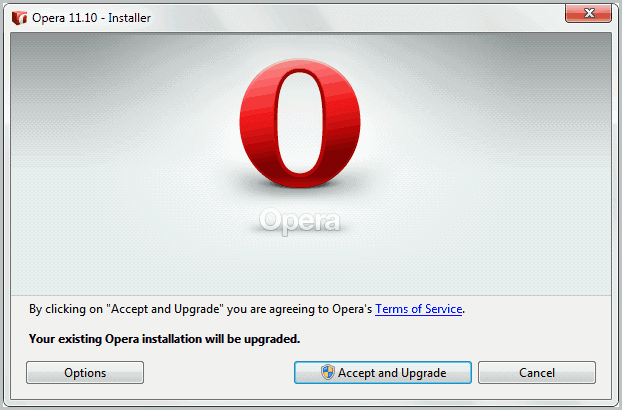 Users should check the Options during installation as it allows them to install a portable copy of Opera if they like. The What's New in Opera 11.10 page is automatically loaded after upgrade or manual installation. Among the new features is an improved version of Speed Dial which the company calls Speed Dial 2.0. They have basically done away with most of the restrictions of the former Speed Dial. You can for instance add an unlimited number of websites to the Speed Dial page, and the previews are dynamically updated to reflect website changes. Opera 11.10 will also make it easier to install missing browser plugins. For now, it is only Adobe Flash Player that is supported but more will surely follow in later releases. If you do not have Flash installed in Opera you get a prompt when you visit a site that requires Flash. Installation is seamless and automatic with barely any user interaction. Improvements have been made to Opera Turbo, Opera's own compression engine that compresses requested on an Opera server before they are send to the user. This can greatly reduce the period it takes to download and display the full web page on the user's screen. Web Developers will notice that Opera has added support for new CSS3 elements like linear gradients and multiple columns. The HTML5test reflects this with a slightly better score of 265 out of 400 points (the beta was at 251 points, Opera 11.01 at 241 points). Interested users find the latest Opera 11.10 downloads over at the Opera website. You can also take a look at the changelog for in depths information on all changes in this new release. In other news; Opera is now offering a web email service that's free for anyone to use. It is called My Opera Mail. Running beta and running update check gave me notification and download.